I remember the summer my Dad decided to grow hollyhocks. Dad had never been a gardener. While he loved to be outside doing yard work, his landscaping skills focused on destruction more so than production or creativity. While spending time on his family’s ancestral land in rural Wisconsin, he loved to clear brush with a chain saw, gather it into huge piles and torch it. As we gathered around the fiery inferno, the thick smoke billowing into the sky, I imagined people from miles around could see the results of Dad’s brush fires. As a kid, I always wondered if folks in the next county might think a building was burning down and call out the volunteer fire department. I secretly worried that they might haul my dad away to jail for starting such a huge fire without a permit, but those fears never came to pass. Maybe they were used to weekend brush warriors like my dad. “That city slicker over in Poynette is burning brush again,” the folks would say, shaking their heads. Back home in the suburbs, Dad’s yard work consisted of mowing the lawn and trimming the bushes. Well, perhaps “trim” is not the right word; “disfigure” might be a better description of his technique. There was plenty of marital discord that resulted from Dad’s landscaping style, which was more utilitarian than artistic. Inevitably, the hedge trimming session would end with Mom fretting about what the neighbors were going to say while Dad would put an end to the argument by saying, “Do you know what the difference is between a good haircut and a bad haircut? Two weeks.” Mom would retreat into the house with a sigh while Dad would fire up the gas grill and make a brandy Manhattan to celebrate a job well done. 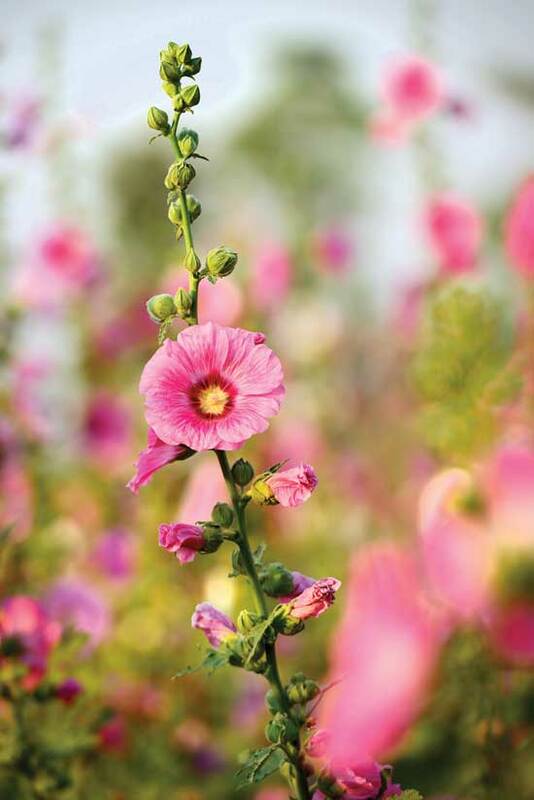 Creating beauty was not really high on Dad’s priority list, which made the summer he decided to grow hollyhocks even more memorable. He was 69 years old that summer, and he began to reminisce about the colorful tall spires that graced the garden fences of his youth in a small Wisconsin town. He thought they would look pretty growing against the cream-colored suburban ranch home he now shared with just my mom, as all the kids were grown and gone. I lived a couple of miles away, and my husband and I had just moved into a home with a sunny little spot in the backyard. I was interested in gardening as a way to beautify our new digs as well as give me something to do to pass the time while outdoors with our three small children. While Dad researched his hollyhocks, I built a raised bed and experimented with some vegetables, with limited success. We kept each other informed of our gardening victories and defeats, and it was fun to have a new way to relate to one another after a 32-year relationship as father and daughter. Hollyhocks, as it turns out, don’t really produce many blooms the first summer, so it would be a full year before Dad enjoyed the fruits of his labor. And enjoy them, he did! The next summer, the flowers were gorgeous with blossoms of pink, red, magenta, yellow and peach. As they grew taller, they threatened to fall over with the weight of the gigantic blooms, so Dad spent hours rigging them up just so with string. He would point them out to anyone who came up the driveway, so gratified was he with his experiment. He began to research ways to save the seeds so he could spread them around. I was less than encouraged with my own gardening attempts, and engaged in my own share of research that growing season. At the end of the summer, I finally had managed to grow a pretty decent garden and Dad carefully harvested and dried his hollyhock seeds. He proudly handed me an envelope of them to plant in my garden the next spring. I can’t remember exactly when it happened, but sometime during that year, Dad began to have a great deal of pain in his hip. He limped around for a while before finally deciding to see a doctor. Tests and surgery ensued, when it was eventually discovered that the cause of the trouble was melanoma, a cancer that is very treatable if found and removed when it originates on the skin, but much less so when it has spread to one’s hip – or anywhere else for that matter. The prognosis was poor, but Dad was not about to give up without a fight, so he began an aggressive treatment plan of chemotherapy and radiation that dominated his remaining days, weeks and months. The next summer, I didn’t pay much attention to the hollyhocks in Dad’s garden. I was too distracted by his illness and fierce, relentless treatment regimen to give them more than a passing glance. If he enjoyed the flowers, I don’t remember him talking about them much. One day, I came across the envelope of seeds he had saved for me and I sprinkled them around my garden, wondering if Dad would be around the following year to see them bloom. I said a little prayer of gratitude in the garden that day for my hollyhock seeds and the man who gave them to me. I thought for a few seconds about praying for him to get better, to be cured of the cancer, but I have always been skeptical of praying for personal wishes to be fulfilled. The stories of people saying, “God heard our prayers and spared our house from the tornado!” while their neighbor’s house was completely destroyed left a sour taste in my mouth. “Thy will be done” was much more reflective of my view of the workings of God. But after a few moments of thought in the garden that day, in the tradition of the Hail Mary (as much as I Iove the Catholic one, in this instance I mean the football one) I decided to venture a prayer that my dad would see my hollyhocks bloom the next summer. If there’s one thing you can count on, it is the passage of time. Through a haze of living, working, parenting and watching my dad “play the hand he was dealt” another year passed, slowly in some respects and in the blink of an eye in others. The next Memorial Day, when my dad who had always been a strong bull of a man was weak and tired and so sick from chemo that he couldn’t keep down the one tiny piece of cantaloupe he ate at our family picnic, I said to my husband, “I think this is the beginning of the end for Dad,” and he held me as I cried that evening. My hollyhocks grew quickly and thickly in the garden, a tangle of green stalks competing for sunlight as they pressed higher and higher. Dad was too ill to come over, but each time I visited him at home or in the hospital, I would tell him about how tall the hollyhocks were getting. When they started to bloom, first one flower, then ten, then twenty, Dad was in the hospital for another treatment. I hoped he and Mom might be able to swing by my house after he was released so he could see them for a few minutes. I knew they would bring a smile to his face. He would never come home from that treatment session. The evening I got the call to come quickly to the hospital, I knew why I was being summoned. The next few days were a whirlwind of activity, with family members arriving from out of town, neighbors and friends stopping by to pay their respects, and a funeral to plan. As I stepped out the back door of our home the morning of the funeral, making sure the children had clean clothes on and combed hair, I almost missed seeing the hollyhocks. As I stood up from re-tying my five-year-old son’s shoe, I could hardly believe my eyes. Overnight, every stalk had burst into bloom in a chaotic, brilliant display of color. I had never seen a garden like it, and I have never seen another one since. This was no orderly cottage garden of days gone by, but a raucous, uncivilized, rampant party of flowers! I smiled, because I knew that Dad was enjoying his hollyhocks. Mary O’Connell lives and gardens in Wauwatosa, Wisconsin. She is Training Coordinator and Board president of LifeWays North America.